Back in 2013, Alexandra Lamontagne decided she need a change. "I was kind of planning to change my life, and do something good," she told The Dodo. Lamontagne had always wanted to go to Africa, and loved animals, so she decided to look into volunteering at a wildlife facility there. When she began to research volunteer opportunities, she was overwhelmed by the amount of self-described sanctuaries, but one South African location stood out. "She advertised in so many places," she said of the sanctuary's owner. 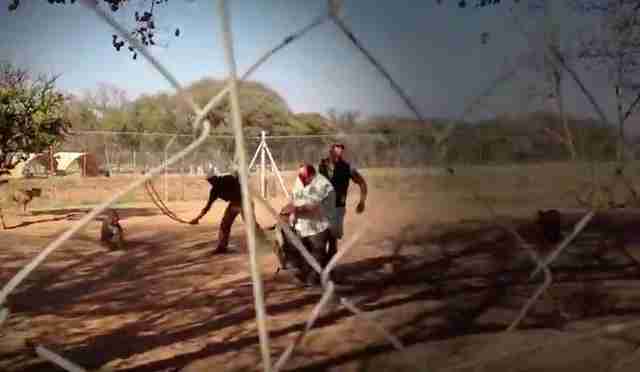 The facility billed itself as a monkey rescue, with a few impala and other animals thrown in. "They never mentioned any lions," Lamontagne said. She happily scheduled the trip, and set out from her home in Canada expecting several weeks of fulfilling work helping care for and rehabilitate injured monkeys. Unfortunately, she got much more than she bargained for. "When I arrived there, first thing, the place was really not what they advertised on the net," Lamontagne said, adding that she'd have run-ins with cockroaches in her bedroom every night. "It was gross, filthy, disgusting." But she fell in love with the animals, and was happy to stay. Shortly after her arrival, though, she had another surprise. "One day they told me they have five cubs they're going to put me in charge of," Lamontagne said. Though she had no experience with lions, the sanctuary turned over the five motherless infants to her. For the next several weeks, she fed them every few hours and did her best to play foster mother, though she was entirely unprepared. "I just fell in love," she said, adding that she couldn't help herself. "They were so cute." But something seemed off. When Lamontagne asked where the five cubs had come from, the sanctuary vaguely told her that they had come from a vet. But Lamontagne said it didn't seem right that an urban vet would stumble on a litter of motherless lions. "Everyone thinks South Africa is wild," she said. "No, it's buildings. You cannot find them [cubs] on the street." Lamontagne knew something was up, but the more questions she asked, the more defensive her employers became. "At one point I was asking so many questions they told me to shut up," she recalled. 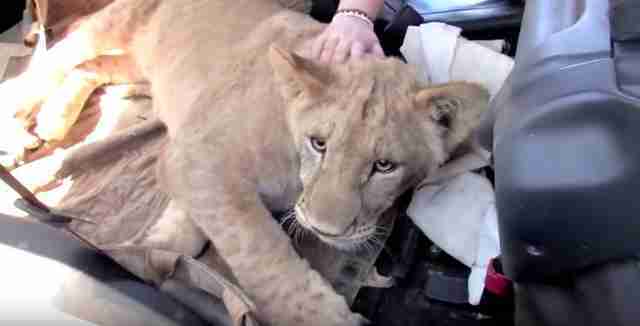 What the sanctuary did tell her is that the baby lions were being raised to be sent to a zoo in Copenhagen, Denmark. "I freaked out because, for me, volunteering for animals is not [about] bringing them to zoos, because I do not like zoos," she said. "Animals should be in the wild space ... I was kind of sad that they were going to end up in zoos, and everyone was going to bang on their plastic walls." But she had already fallen in love, and so decided the best course of action was to be there for the cubs while she could. "I shut off my mind and said, I'm just going to give them the best care," she explained. When her time was up, Lamontagne returned home, though she couldn't get the little lions out of her mind - in particular the smallest, whom she named Serabie and formed a special bond with. And shortly after her return, she received a nightmare email from an employee at the facility revealing the truth about the little cubs she loved: They had been borrowed from a canned hunt facility, and were being sent back to eventually be killed by hunters. "I was pretty pissed off," she said. "I was like, you fooled me." Lamontagne is one of the hundreds of volunteers each year who are duped into working for Africa's canned lion hunt industry, a shady operation that breeds thousands of lions to be sold to hunters looking for an easy kill. It's estimated that there are 7,000 captive lions in South Africa's canned hunt facilities alone. 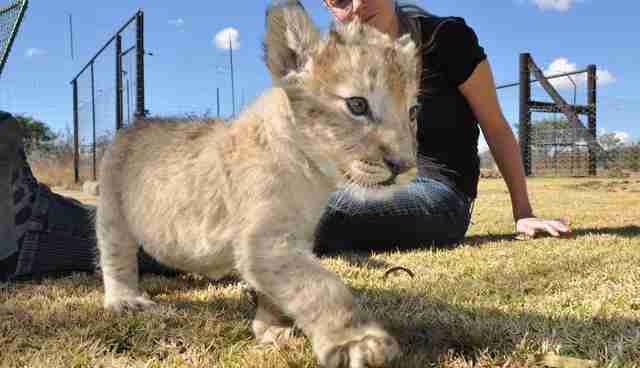 The lion cubs are stolen from their mothers at just a few days old, then handed off to paying volunteers to raise them. While they're still young and cute, they're peddled off to tourists for cuddles and photos. As adolescents, they're trained to go on lion walks. When they reach adulthood, they're priced according to how nice they'd look stuffed, escorted into an enclosure, and shot by hunters who want the convenience of killing a tame lion. 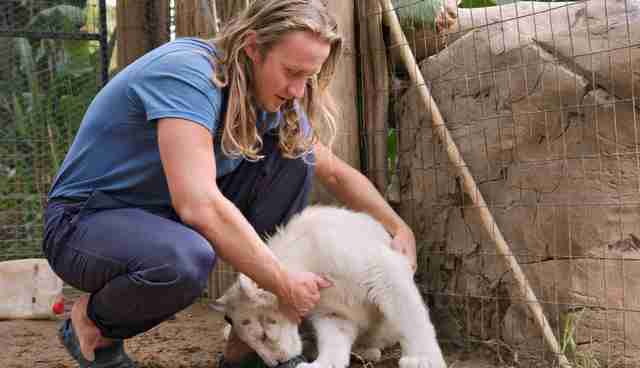 Throughout the whole process, they live in dirty cages, are fed rotten meat and often receive minimal medical care, according to the upcoming documentary "Blood Lions." 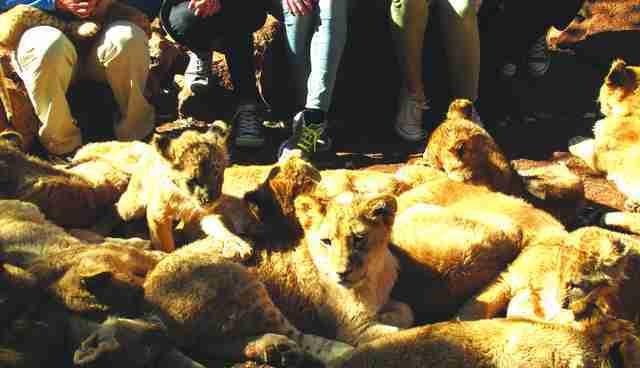 Paying volunteers are the backbone of the industry, and canned lion farms resort to a number of dirty tricks to entice both young travelers, like Lamontage, and uninformed tourists to fund them. 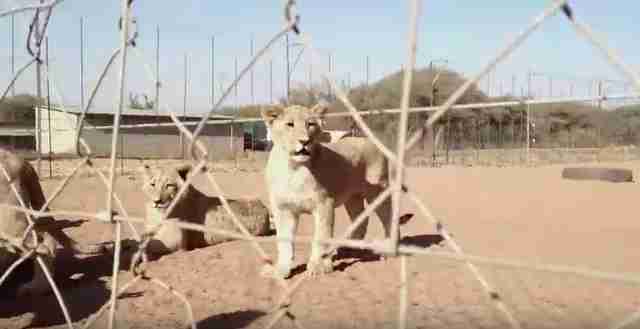 Virtually every facility in South Afnrica that offers lion petting or lion contact is either a front for a canned hunt facility or a disreputable sanctuary that engages in similar practices. Like so many deceived tourists, Lamontagne was falsely promised that she would be aiding in rescue and conservation efforts. She also had to pay $2,500 per month for the privilege of raising the little lion cubs - money she thought would help threatened animals. And while Lamontagne worked at a canned hunting affiliate instead of the farm itself, her experience was similar to that of many other volunteers. 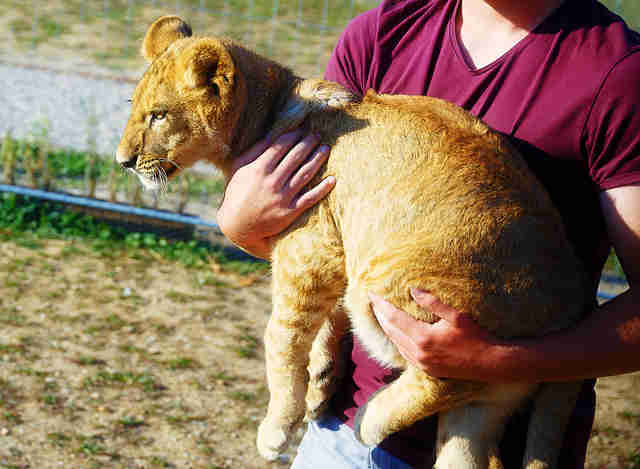 "They attract people like, oh, we're going to teach you about lions and you can take pictures having a young lion," she said of the canned hunt farms. "It's a lot of work, and the canned hunting place, they don't want to do it." So they paid the facility Lamontagne worked at to have one of their volunteers do the work for them. "I was in shock," she said of the moment she found out what had happened. "I just couldn't believe I was a part of it." Her mind quickly went to Serabie, the little cub she had fallen in love with and unwittingly turned over to the hands of hunters. 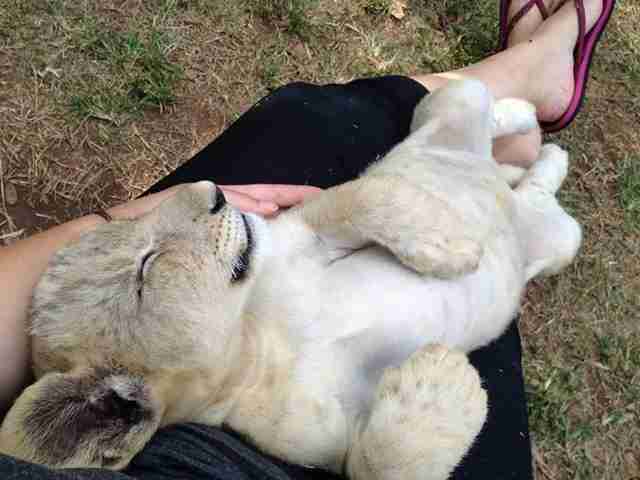 Lamontagne immediately reached out to the canned hunting facility and asked for them to turn over the little lion. "I just didn't want to buy her and rescue her," she said. "For them it's the same thing. They're going to get money out of it." 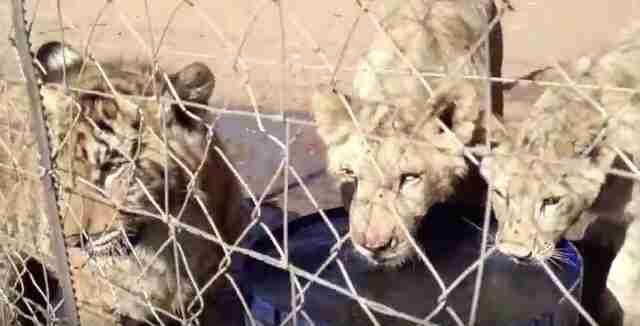 The farm refused, but when Lamontagne threatened to make a documentary revealing the dark truth behind their lion farming, they gave in. "At the end they were just like, OK, but if we see a camera the deal is off." Lamontagne returned to South Africa and traveled to Serabie's breeding farm to collect her. Though she declined to name the facility, noting only that it was in South Africa's Limpopo province, she did bring a hidden pencil camera along with her and ended up recording secret footage of the premises. It was as bad as she'd imagined. The main pen she saw, around 30 square feet, held around 15 lions, and it was clear they weren't being fed properly. "It's kind of a mess because they're not like feeding one lion by one lion," she said, explaining that the workers would throw all the meat in at once. A tiger was being kept with them, and since he was stronger he would monopolize all the food. Other groups of lions were scattered around the property. "You see the cubs that are 3 to 6 months old, and they are crying," she said. "At the back, at the end that I couldn't approach, were the lions that were ready and old enough to get shot. Because the males had their fur and stuff like that. It was so terrible." But the biggest surprise was the change she saw in her little cub, who just a few months before had been so trusting. "She was so gentle and used to not be scared of humans, obviously," Lamontagne said. "But all the animals were scared of humans." She quickly realized where that fear came from when she witnessed workers beating the months-old cubs with plastic tubing - which she captured on film. Fortunately, Lamontagne got Serabie out, and she's now living safely and happily at Emoya Big Cat Sanctuary. But Lamontagne hasn't stopped fighting against the canned hunting facilities she accidentally fell prey too. She said she gets a lot of emails from former volunteers or concerned people asking her to help purchase lions to get them away from the lion farms, but explained that doing so would only line the pockets of the lion farmers and encourage them to keep breeding. The only way to stop it is through legislation, she said, or more airline bans. Around 50 percent of the lions killed are shot by American hunters, and if airlines refuse to ship lion trophies to the U.S. and other countries, there would be little incentive to keep up with the hunts. "We need to educate people, and that's how we're going to stop canned hunting," she said. But at the same time, though she's happy she was able to rescue Serabie, Lamontagne said she can't help but think of all the other lions who weren't so lucky. "When you see her old enclosure and then her new space, you just realize that you left 14 other lions [behind]," she explained. "I will never forget that."